We were on the Isle for New Years Day and I got just the start I wanted when I drew 106 but freezing rain and a cold wind made it very uncomfortable and I only had two sticklebacks! 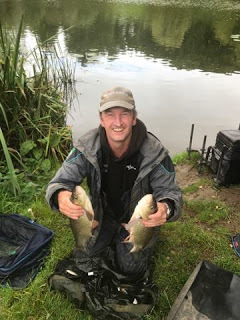 The other two at Redbridge struggled as well while Hambridge proved once again that it’s the place to be with Leighton Cox catching some nice perch and roach to win with 10lb with Fieldy second from 126 at Isle Brewers with 6lb 2oz and Hurf third with 4lb 4oz from H2. For the next match, conditions couldn’t have been more different, it was mild, some rain had put colour and pace in the river and I had a cracking days fishing catching 135 fish (mainly roach with odd dace, chublets and gudgeon) for 20lb 5oz from peg 128 at Isle Brewers and my first win for a while. Adie Bishop was second with 10lb 9oz from H5 and Graham Field had 9lb 4oz for third from peg H2. Decent conditions for round seven of the Royal Oak league and I managed to get a draw at Hambridge, I’ve had a steady day catching mainly roach for 8lb 7oz and third place behind Fieldy with 10lb 8oz and Rob Cox with a brilliant 20lb from peg 124a, Rob had five chub for 10lb odd and nearly the same weight of quality roach. The penultimate round of the V.E.S. Precision league and I needed a section win to realistically stand any chance of a top three place in the league. After a week of hard frosts and good draw would be essential and I got it with peg H4 at Hambridge, it was a struggle and I caught a few small fish down under the bridge for 2lb 11oz which I didn’t think would be any good but it had been really tough for everyone and Adie Bishop needed just 2lb 13oz to win and I missed out on winning the golden peg by 2oz. To rub salt into the wound Steve Parker pushed me down into third place as he had 2lb 12oz and took a pound off me too! Not a lot to say about the final match of the month, drew peg 92 at North Bradon which has been really poor and true to form, I weighed 6oz which was two dace, two chublets, a gudgeon and twelve minnows! 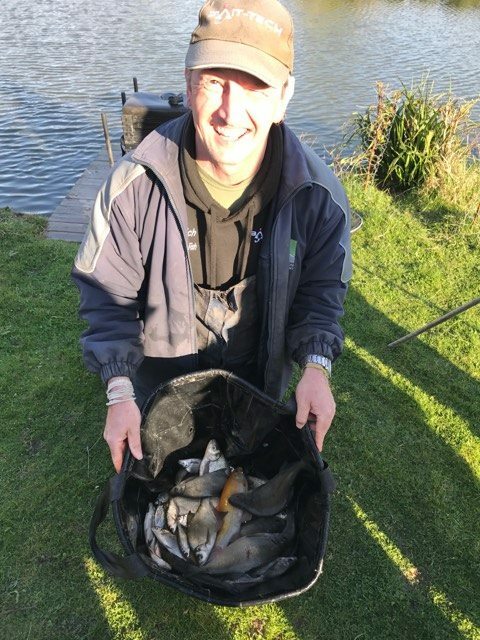 Terry Morgan won with 10lb 13oz of quality roach from peg 128. First match of the month was the open which was at Dillington and I drew peg 13 on the bottom bank and had a bite a chuck all day, mainly roach along with a couple of chublets and the icing on the cake was a 2lb chub fifteen minutes from time. I weighed 12lb 6oz which was just short of Justin Charles who had a bream and skimmers for 12lb 8oz but a lovely days fishing and a nice pick up of £75. The final round of the Royal Oak League saw me on peg 129 and I’ve struggled for 2lb 13oz although I ended up winning the section by triple default! I also finished second in the league behind Graham Field who won the match and the league with 14lb of chub, perch and roach from peg 124. Young Stuart Aplin had a lovely net of quality roach weighing 10lb 2oz for second place and Terry Morgan was third with 4lb 11oz from peg 126a. The following week was the final V.E.S. Precision match and I had mixed feelings when I drew peg 109 at Redbridge, it’s a peg I’ve wanted to fish for a long time but it’s been poor in recent matches. It looked nice but after three and a half hours, all I had to show for my efforts were a few minnows. Then a decent fish rolled and shortly after I had the first of five chub, I weighed 14lb 2oz to win the match and I ended up second in the league so a nice pick up of £105. Barney’s Pairs Open was the final match of the month with an angler on Harry’s Pond and the other on Dillington, I drew peg 3 on the far side, not a great area and I’ve caught odd fish throughout the day to finish with 14 carp for 28lb 1oz and third on the lake, my partner, Justin Charles, was also third and we ended up in the third place behind Rob Cox and Baz Morgan who won with three points just edging out Adie Bishop and Rich Studley on weight. A nice day and we raised a tidy amount for charity. Lowlights – Being 2oz off winning again! I started March at Summerhayes in atrocious conditions, it was a rover and I made a big mistake by picking peg 3 on Longs, I ended up with 6lb 9oz of silvers and 26lb carp for nowhere. 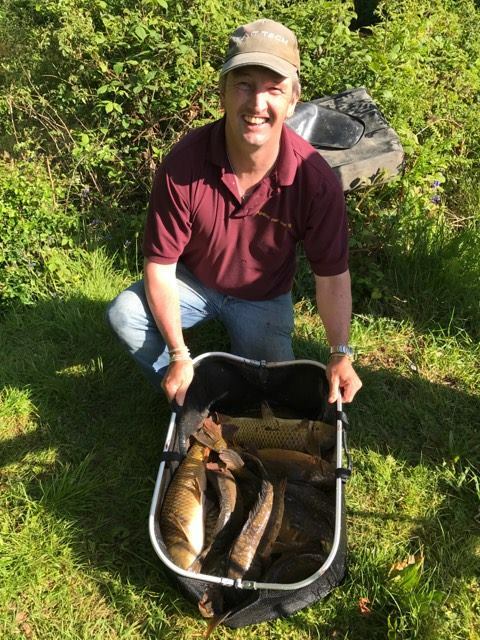 After missing out on the Perry St league last year, I was delighted when Les phoned and asked if I wanted to fish this year, of course I said yes and there was also a pre-league match which would give me an idea of what to expect. It was great to see all the guys although the Torquay Tart was also in attendance. I drew peg 14 which I was fairly happy with, I had an enjoyable day catching six decent carp shallow and one late on meat for 37lb 8oz, a section win and £30. Steve Bishop won with over 78lb from peg 4. The best part of the day was taking another pound off the Tart. For the next match I was back at Summerhayes but on Sellicks this time and I was hoping for a nice days silvers fishing, that went out the window when I drew peg 23, I struggled for 5lb 6oz of silvers and 18lb 7oz of carp. Lee Williams had the top weight with 90lb 8oz and Paul Purchase had a cracking net of silvers weighing 17lb 3oz and Janders took a pound off me as he weighed 10lb 13oz of skimmers and tench. 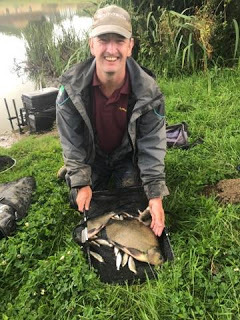 I was back at Summerhayes for the last match of the month and when I pulled out peg 39, I wasn’t too impressed as it’s not usually a great silvers peg, I ended up having a lovely day and weighed 13lb 12oz of skimmers, tench and roach to win the silvers. Steve Kedge had the top weight on the day with 86lb 8oz. Lowlights – Choosing peg 3! April saw the start of the Perry St and Sadborow League, I was fairly pleased with peg 13 on the former but it was hard going and I ended up with 28lb which was one fish short of a decent result as Bushy had 32lb 10oz for second in the section and Exeter Mike had 38lb from peg 12. All the leading weights came from Sadborow with Les winning with 115lb from peg 5. The next match was on Sellicks at Summerhayes and I was really looking forward to it, I drew peg 2 on the near side when all the silvers weights have been coming from the top end or the far side which about summed the day up. I had a steady start catching a couple of skimmers and a few small tench in the first two hours only for the wind to get up and it went from blue skies and blazing sunshine to freezing cold and blowing a gale! I had a few carp but just couldn’t catch any more silvers apart from one small crucian at the death which gave me 3lb 7oz for nowhere. Exeter Mike won the silvers with 6lb 15oz and Ads Palmer had the top weight on the day with 98lb 7oz. Good Friday saw me at Summerhayes for the silvers only open on Longs, it was well attended with 18 anglers fishing, I wasn’t too impressed when I drew peg 5 but had plenty of space which I thought would help. I’ve had a really nice days fishing catching skimmers and a tench (plus plenty of nuisance carp) for 11lb 3oz which was just enough to win ahead of Gary Butler with 11lb and Jeff Sparkes with 10lb 7oz. I had a nice pick up of £85 plus a place in the Champion of Champions final later in the year. Then it was onto Perry St for the second league match and I drew peg 2, I had a really nice day catching 13 carp shallow for 50lb 6oz which won the section and was top weight on the lake. I picked up £55 but the icing on the cake was a pound off the Tart who came second with 49lb 8oz. Another tough day on Sellicks followed and I was carped right out on peg 5, managed one crucian, four skimmers and four tench for 4lb 14oz and second in the silvers behind Jess Jordan with an excellent 12lb 10oz. Mark Jones had the top weight on the day with 86lb 8oz of carp. The last match of the month was a rover on Longs at Summerhayes and I got off to a great start when I had first choice and picked peg 38, I had a slow start on the silvers front and got carped out on all my lines to finish with 8lb 7oz of silvers to finish just short of Janders who was second with 9lb 2oz. We were back at Summerhayes for another rover and choice 18 out of 21 was far from ideal, with no pegs left on Sellicks, I ended up on Willow and really struggled, I had 2lb 14oz of silvers and chucked back around ten carp. Round three of Chard’s league saw me at Sadborow for the first time since 2007!, I was disappointed to draw peg 2 as it had been poor in the first two matches but when I got to my peg, there were loads of carp cruising about and I had a lovely day catching 32 carp and a good skimmer for 94lb 6oz, second place on the day and a nice pick up of £85. I did lose a pound to the Tart who won with 103lb 14oz from peg 6. I was on Perry St for round four and was disappointed when I pulled out peg 1, it’s a corner peg but hasn’t been doing very well. I lost a foulhooker early and then didn’t have a bite for three and a half hours. I eventually went 14.5 metres to my right and had five carp and lost one on the whistle, should have done it earlier as two more fish would have got me third in the section, lost pounds to Picky and the Tart. Bushy had the top weight with 51lb 14oz with Hoff just behind on 51lb 4oz. I finally managed to draw on the far side of Sellicks and had a lovely day catching two big skimmers, six smaller ones, a big crucian, eight little tench (including a golden one) and a couple of roach for 14lb 9oz and second in the silvers behind Rob Birch who had 17lb 4oz. The first match of June saw me at Dillington and I got off to a great start when I pulled out peg 18 which is probably my favourite peg, I caught a few fish short, then long and then shallow but several people were catching bream and skimmers opposite so I put in some kit and fished corn on the hook but never had a bite on it! I ended up chasing my tail and finished with 91 fish for 7lb 10oz and second in the section behind Jess Jordan who had two chub and a big bream from 24 for 11lb 9oz. For the next match I phoned Pete at Summerhayes to book in and was delighted when he said we’d be on Sellicks but then during the week he called to say we were now on Willow and Lily! I drew peg 7 on Willow and the last time I was on that lake, the top silvers weight was less than 7lb so that would be my target today. I got off to a great start catching ten skimmers for about 4lb in just over an hour but then struggled for the odd roach and carp but luckily my 5lb 2oz of silvers was enough and I had a nice pick up of £48 plus a nugget off Lee Williams. Nigel Wickham had the top weight on the day with 61lb of carp. Then it was back to Perry St for round five of the league and I was really pleased to draw peg 12, I had a steady day catching shallow to end up with 14 carp for 63lb 6oz, second in the section and £55 behind Bushy who had 79lb 8oz from the peg next door. Sadborow was the following week and I drew peg 9 which had won the last match and it was solid, caught really well for the first four hours, again all shallow and despite not catching in the last hour, my 44 carp weighed 120lb 6oz which was top weight on the day and I picked up £90. I was slightly disappointed to miss out on beating my best ever match weight by a pound but yet another nugget from the Tart made it more bearable! Dillington was next and I was gutted to draw peg 23 especially when 24 wasn’t in, although I thought I might have a chance of catching by the bush although it was 16 metres away. To cut a long story short, I had a foulhooked skimmer and lost a good chub on my light rig and then spent most the match trying to catch a bonus fish which didn’t happen. In the last hour and a half I caught chublets quite well fishing shallow and weighed 4lb 12oz but just missed out on the default section money by 2oz! Adie Bishop won again with 44lb 9oz of chub and bream from peg 1. The next match was a charity pairs with a twist, you wouldn’t know which lake you were on until the morning or who you were fishing with until after the match. I got the pond I wanted when I pulled out peg 9 at Harry’s and had a lovely day’s fishing catching carp shallow to weigh 62lb 14oz which was second on the lake behind Bill Hopping who had 114lb 14oz for a comfortable win. At Dillington, Ashley Tomkins had an awesome day to reclaim the match record with 69lb 3oz of bream and skimmers from peg 2. Back at the results and I got paired with someone who didn’t do very well so no coin again, but on the plus side the anglers raised a fantastic £120 for Macmillan Cancer Support. I was looking forward to the next Chard match at Sadborow although peg 6 wouldn’t have been my first choice, it’s a good peg, albeit a bit awkward to fish. There were loads of carp swimming about and I caught quite well for two hours but then began chasing my tail somewhat and kept getting distracted by fish in the margins. I had one fish from the five metre line and mugged a couple in the last hour but my 75lb 14oz was way off the pace, I lost a nugget to Brendon who won with 112lb 1oz and Janders also beat me although a pound off Picky eased the pain a little. For the penultimate league match I was on the high numbers at Perry St and hoping for a peg towards the far end but pulled out 19 which hasn’t been great and I thought I’d be in for a struggle. A couple of early carp caught shallow settled me down and I was doing alright. I even started getting a few fish on the meat line until disaster struck and I lost a lump when the line snapped above the float and didn’t have a suitable replacement which was really poor preparation on my part. I managed another shallow and then right at the death I hooked one that I was determined to get in and was playing it really carefully when the hook pulled out! I just knew those lost fish would cost me, I had 11 carp and a decent skimmer for 45lb 12oz and when Picky was next to weigh and beat me by 2oz, I thought I’d finish well down as several others were admitting to 40lb but I ended up third behind Picky and the Hoff who won with 52lb 10oz from peg 11. I picked up £30 plus that all important pound from the Tart. Howard had the top weight on the day with 86lb 2oz from peg 4. Then it was back to Dillington and I’ve finally drawn a peg on the far side, I fed a line with corn and casters for bream but not had a bite over it until the last half an hour when I’ve had a good bream and two skimmers to add to 8lb of roach plus a pound tench caught on the two sections to hand rig to weigh 15lb 5oz and finish third behind Nick Payne with 15lb 13oz and Jake Woodard with 21lb 3oz. Lowlights – Not having another meat rig! First match of the month saw me fishing the new lakes at Todber Manor for the first time, I drew peg 38 on Hill View which meant nothing to me, I decided to keep it simple by fishing two short lines, it was slow going for the first three hours and I probably only put 15lb in the net. I came in on the inside line and started catching really well and the swim just got stronger and stronger, ended up with 49 fish (37 carp to 12lb plus skimmers, tench, roach and perch) for 97lb 8oz and just missed out on the default section which was won with 101lb. So not a bad effort for my first visit and I’m looking forward to going again. The following day it was the final Chard AC league match and I was desperate to avoid peg 1 but of course drew it, I had seven carp for 30lb 14oz and I needed one more for a decent result and I lost five! Ended up joint sixth in the league and picked up £15. The next match was at Dillington and I was fairly happy to draw peg 24 as it can be good but after spending most of the match trying to catch big fish, my modest 4lb 1oz came nowhere, Bill Hopping won with 14lb of paste caught bream and skimmers from peg 20. It was back to Summerhayes for a match on Sellicks and I was disappointed to drew peg 7 on the near side but actually had a really enjoyable day to win the silvers with 8lb 12oz of skimmers, little tench and a crucian just edging out Rob Birch who had 8lb 9oz. For the next Summer League match at Dillington I drew just where I wanted on the far side but scorching hot conditions made it hard going for everyone, I had a couple of skimmers on corn and some roach for 6lb 3oz but missed several bites on corn which was costly as Frank won with 10lb 9oz and 8lb 2oz was last in the frame. On the Bank Holiday Monday I was at Summerhayes on Longs for a rover and ended on peg 33 where Roger Russell had over 28lb of skimmers on Friday, I had almost a perfect first hour catching a tench, three crucians and six skimmers (plus a couple of nuisance carp) for about 8lb but then struggled to catch decent silvers for the remaining five hours and my 12lb 4oz was a long way behind Rob Birch in second with nearly 17lb and Roger with a brilliant 29lb 15oz. Lowlights – The remaining five hours!!! I started the month back at Summerhayes for a rover on all ponds and managed to get on Longs peg 32, had a steady first three hours catching skimmers along with the odd tench and crucian but then put very little in the net for two hours before catching well again for the last sixty minutes to weigh 16lb 4oz and I needed a couple more as 19lb 8oz was second in the silvers. For the last Summer League match at Dillington I drew peg 4 which is one of the ones I fancied, had a few bits early before fishing for big fish with corn, missed six good bites throughout the day and then with an hour and a half to go, I had a 4lb chub followed by one of 3lb before losing one. My next fish was a chublet and then I lost another big chub that snapped me and time was running out, I did manage another chublet. I weighed 9lb 8oz but knew those lost fish would cost me and they did as Bill won the match and league with 15lb 8oz and there were two 10lb weights! I did pick up £20 default section money but a good chance to win the match was wasted. I had two nice chub but lost two as well! Another match at Summerhayes, this time on Sellicks, I drew where I wanted, peg 18 on the far side but it was really hard going and I had four skimmers, one little tench and a couple of bits for 2lb 9oz which was good enough for second in the silvers behind Roger Russell who had a 2lb skimmer in the last half an hour to beat me by 2oz! The final match of the month saw me back at Summerhayes and on Sellicks again, I drew just where I wanted, peg 19 on the far side but in a match very similar to last weeks, I had a few silvers for 2lb 6oz and nowhere, Rob Birch won the silvers off the golden peg with 7lb 13oz to take home a nice payday. I was really looking forward to getting back on the river especially with reports of lots of fish in all areas, with Upper and Lower Coxes and Isle Brewers in, I had a wish list of pegs but I pulled out 28 which wasn’t one of them. It looked good and I had some nice dace and chublets for 4lb 7oz but was well off the pace, Graham Field won with a lovely net of fish, 21lb 10oz, Paul Homewood was second with 15lb 6oz of quality roach and chub from peg 128 and Jake Woodard was third with 12lb 8oz from peg 125. I didn’t fare much better in the next match either, I wanted to draw at Isle Brewers but pulled out peg 14 at Coxes and although it’s one of my favourite pegs, with the river being so low and clear I thought I might struggle and I was right, I ended up weighing 3lb 7oz of dace and chublets. Steve Parker won with 8lb 11oz from peg 128. Then I missed the next match due to doing my back in, I’d booked the following Friday off so I could fish the silvers match at Summerhayes before the final the week after. It was a rover and I got just the start I wanted when I had first choice, I went for peg 34 and had a really good first three hours when I put 7-8lb in the net and was well on my way to my 12lb target but then like the other two times I’ve drawn in the 30’s, I’ve really struggled. I ended up with 21 skimmers and a few tiny roach for 10lb 6oz and just missed out as John Barker had 10lb 13oz and Jeff Sparkes won with 12lb 1oz. Sunday saw the match switched to Dillington and I was happy when I drew peg 14, one of my favourite pegs, my plan was to fish for roach but also have a big fish line by the reeds and try it for ten minutes every hour. I felt I fished quite a tidy match and had 6lb of roach, gudgeon and rudd plus two nice skimmers from my big fish line for 8lb 9oz, third place and £25 to end my bad run for now. Baz Morgan won with 14lb 5oz of bream and skimmers from peg 24 followed by Adie Bishop with 11lb 15oz of small fish from peg 6. The following Friday I was at Summerhayes for the Champion of Champions Silvers Final, which I’d been looking forward to for ages and drew a decent peg when I pulled out number 17. Things got even better when I got to the peg and I saw I had loads of space which could only be a bonus. I had a steady start catching some skimmers from the top two line in the first couple of hours before getting carped out. I ended up with 4lb 14oz which I was sure wouldn’t be any good but sneaked into fifth place and last in the money picking up £40. Ziggy Slowinski was crowned the champion with 10lb, followed by Roy Hughes with 8lb 4oz and Glynn Wickham with 6lb 1oz. The last match of the month was round two of the V.E.S. league on the river and with 15 booked in, the pay out was tweaked a bit to give the anglers at Coxes a chance as all the top weights have been coming from Redbridge and Isle Brewers. Of course I drew peg 29 at Lower Coxes and the last time I had it, I caught one minnow. It actually looked really nice and I started catching small chublets but then some lovely dace started showing and I caught odd fish by swapping between two lines to end with 31 fish for 5lb 10oz which was enough for second in my section and another £40. 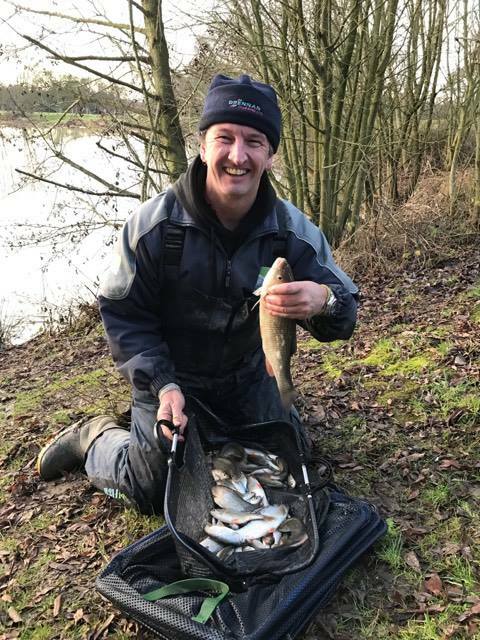 Frank Woodard had the top weight on the day with 18lb 5oz followed by Leighton Cox who had 17lb 4oz which included four chub for 14lb plus some quality roach but he lost four chub as well. Highlights – The last three matches! Lowlights – The first three matches! With Rob and Hurf away, it was down to me and Steve P to organise the next match, I’d been dreaming about peg 110 all week and with only two balls left in the bucket, it was still in there but Bill Hopping spoilt the party. I had the last peg which was 128a and I was fairly happy with that as some big chub have been hooked (and lost) there in recent weeks, I only caught a few bits but hooked three chub, getting two out. I weighed 7lb 15oz which was enough for third place and £20 (plus a pound off Steve P!) but I was only just behind Adie with 8lb 8oz and Bill with 8lb 10oz so that lost chub was costly! For the next match, the Isle was up and coloured and it was a struggle for most, I made the most of drawing 126 and on a poor day, my 3lb 10oz of roach and dace was enough for a very welcome win. Adie Bishop was second from his favourite peg (128) with 2lb 4oz of small fish and Fieldy was third with a pound of dace from peg 120. The river was in good condition for the next round of the V.E.S. Precision league and Hurf had put in a few pegs at Hambridge for the first time this series, with loads of small fish topping I thought I’d bag up but it was actually a bit of a struggle, I had two good perch (and lost one) plus a few small roach in the first two hours and then it died a death. In the last hour I started getting a few roach and then landed a 5lb pike, I ended up with 25 fish for 3lb 13oz and three section points which wasn’t a disaster. 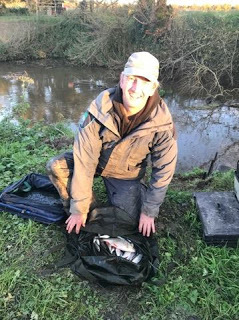 Adie Bishop won from the peg below me with loads of small fish for 14lb 2oz, Karl Aplin was second with 9lb 2oz from 120 and Paul Homewood was third with 6lb from peg 125a. For round four of the IBC league, I drew peg 124a at Isle Brewers, it was a struggle with the river low and clear but I had some quality roach and two chub (one in the last five minutes) for 5lb 12oz and second place behind Baz Morgan who had 7lb 10oz from peg 120. Stuart Aplin was third with a cracking chub of 4lb 4oz from peg 110. The Xmas Fayre was on Dillington and the Canal, I really fancied having drawing the latter as I haven’t fished it for ages but wasn’t too upset when I pulled out peg 18 on the pond, normally a decent winter peg, I’ve had bites all day to end up with 103 roach, rudd, perch and a Dillington barbel for 7lb which put me fifth on the pond. I kept trying to catch a bonus fish throughout the day which has wasted an hour but as Jake Woodard won with a nice net of skimmers weighing 15lb 8oz, it was probably the right thing to do. The Canal fished really hard with Andy Welch needing just 3lb 5oz for top spot. Everybody then enjoyed a hot meal at Ilminster Bowling Club and all the anglers took home a nice prize. With torrential rain and strong winds, we were at Dillington for the next match as well, I was really happy with peg 2 but after the last match I was determined not to waste any time searching for elusive bonus fish. I had bites all day to finish with 122 roach, rudd, perch and gudgeon for 9lb 1oz and second place behind Justin Charles who won with 10lb 10oz and just 1oz in front of Frank Woodard. With a free date, I spoke to Harry and a charity match on his pond was arranged, I managed to avoid the favoured reed pegs again and basically I never had a bite for four hours and then had two carp for 5lb 5oz and a few rudd for 5oz which was enough to take the silvers pool of £20 by default. Rob Cox had the top weight with 42lb from peg 1 by the reeds. Although the fishing had been poor for many, we still raised a fantastic £70 for the Prader-Willi Syndrome Association. With nothing on, I managed to get in on a knock up at Perry St but the end pegs dominated and I drew in the middle and only managed a few skimmers and roach, the Tart won with 51lb of carp. Another knock up, this time at Harry’s on the Thursday and I managed to avoid the two fliers yet again and was blanking after two hours, I started fishing by some dead reeds and caught quite well in spells to finish with ten carp and a rudd for 22lb 10oz and third place. Jake won comfortably from peg 1 with 65lb 7oz. The final match of the year was switched to Dillington with the river flooded, I drew peg 8 on the far side and struggled with the wind and rain in my face all day, I ended up with 75 fish for 5lb 6oz which won the section by default behind Scott Russell who had the top weight on the day with 15lb 7oz of skimmers and roach. Although I had a brilliant 2017, it could have been called the ‘What if?’ or ‘Bridesmaid’ year, I finished second in the V.E.S. Precision and Royal Oak leagues, I missed out on a golden peg win by 2oz and also finished second in the open by the same margin. I also fished Sadborow pond for the first time in ten years and had three lovely days fishing although I missed out on a new personal best match weight by a pound when I weighed 120lb 6oz. I visited a new lake at Todber Manor for the first time and didn’t disgrace myself with 97lb off a mediocre peg but missed out on a section win by 4lb and lost several carp, another case of ‘What if?’. There were no foreign trips this year and I didn’t manage to get on the Wye for the barbel or the Axe for mullet and sadly I’m no closer to catching my first flounder, maybe next year! I was delighted to get in on the Perry St and Sadborow league, the fishing was great and the banter even better, I ended up joint sixth in the league but a few mistakes and lost fish, cost me several places. Dillington continues to evolve year on year and the quality roach and rudd seem to have done a disappearing act with bream and skimmers now featuring heavily, the match record has been broken several times and now stands at over 69lb. It really is an intriguing venue and I look forward to seeing how it fishes next summer, I still think the small fish could do with thinning out a bit though. 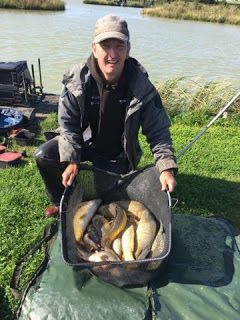 I’ve really enjoyed fishing the Isle as always although it would be nice to try some different sections, Summerhayes has been producing some good bags of skimmers and I’ll be trying my hardest to qualify for the Champion of Champions final again next year. The blog continues to go from strength to strength, it had over 135,000 hits last year but has now flown past 649,000 (which is over 196,000 in 2017!). As I’ve said before, one of the unexpected perks of writing the blog is being contacted by companies to review their products and the two that stand out from last year have been Buff and Peejay Tackle, both a pleasure to work with. The blog is very proud to be supported by Bait-Tech and I’m already looking forward to 2018 when they have some fantastic new products coming out. I also have to thank Hayley for all her continued help and invaluable advice. As we say goodbye to 2017, lets not forget Dave Lawrence and Bob Hammond who we sadly lost and are hopefully bagging up sat round a picturesque lake somewhere where the sun is always shining – tight lines lads. So what’s ahead for Against Men and Fish?, well the Archives series has been very well received and there’s plenty more to come, I’ve also published several guest blogs and would love to feature more so please get in touch if you would like to get involved. There will be lots more reviews and interviews and I’m also hoping to go back to Thailand where I have a new venue in my sights. Of course there will still be lots of detailed match reports and I’ll try my best to mix things up with some different lakes and rivers along with another go for those elusive mullet and maybe even a bash at those flounder!